The ccMiner SPMOD fork for Nvidia Maxwell GPUs (source) has recently been migrated to use the newer CUDA 7.5 from the older CUDA 6.5. The latest version with CUDA 6.5 support was version ccMiner 1.5.74 and the latest version is ccMiner 1.5.78 that already uses CUDA 7.5. The first release with CUDA 7.5 had not so good performance and was slower in some algorithms in terms of performance as compared to the latest CUDA 6.5 release, but the latest code has been optimized to offer similar or even better hashrate in most supported algorithms. We took an Nvidia GeForce GTX 970 (Gigabyte GV-N970WF3OC-4GD) running at stock frequencies for a spin with some of the currently popular algorithms to compare the performance of the latest CUDA 6.5 to the latest CUDA 7.5 release of ccMiner spmod. 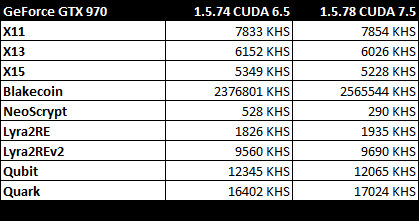 The results in the table clearly show that aside from NeoScrypt the latest CUDA 7.5 release offers very similar or even slightly better hashrate compared to the latest CUDA 6.5 version. The hashrate of X13, X15 and Qubit is still slightly slower, but not much. So unless you are mining NeoScrypt you should have no reasons not to upgrade to the newer CUDA 7.5 releases and soon we are probably going to see even better performance thanks to further optimizations of the code. Do note however that some other Maxwell GPUs might have some more variance in terms of performance difference between the two compared versions.